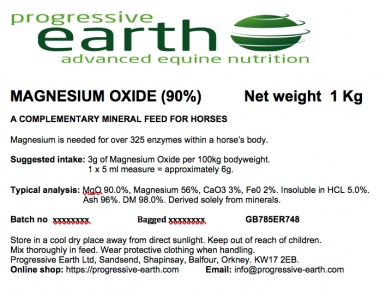 Progressive Earth whey protein isolate is a high quality protein for horses. Isolate is one of the purest whey proteins available, each 100 grams contains 90g of protein (dry basis) and has a comprehensive amino acid profile that provides all the essential amino acids (EAAs), is low in fat and lactose and a rich source of calcium. Protein is needed to support lean muscle mass; muscle, bone and joint structure, vital organ development, immune system health, hoof and connective tissue health. Whey protein isolate is low in carbohydrates making it an ideal choice, for horses and ponies that are prone to laminitis and for overweight horses on reduced hay rations. These horses are often fed later cut forage which may be low in available protein; being low in sugar whey protein isolate can provide the extra protein that is needed without adding the extra calories. Horses can benefit from an increase in protein if they are in heavy work or if they are prone to being lethargic. Horses that suffer with poor hoof and skin quality may also benefit from additional protein. Can help support development of lean muscle mass. Supports tissue repair and muscle growth in exercising horses of all ages and disciplines. 10 -20g of protein per 100 kg of bodyweight. 1 x level 60 ml scoop supplies approximately 20g of protein. Sodium (Na) 200mg, Potassium (K) 400mg, Calcium(Ca) 450mg, Phosphorus (P) 220mg, Magnesium (Mg) 50mg, Chloride (Cl) 50mg. Calcium 0.4 %, Phosphorus 0.2 %, Sodium 0.2 %, Crude Protein 90%, Lysine 8.6 %, Methionine 1.9 %, Ash 3%, Fats 0.8%. 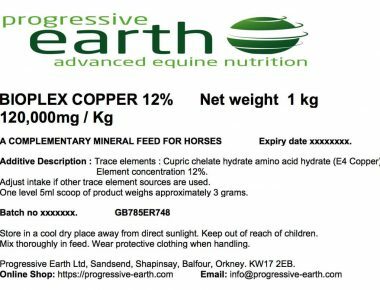 Pack size and availability: Progressive Earth Ltd Whey Protein Isolate equine feed supplement is available in resealable grip seal pouches containing 2 Kg of product. Multiple purchase options are available. BIOPLEX COPPER (copper proteinate) – 12% elemental copper. Equine mineral forage balancing. 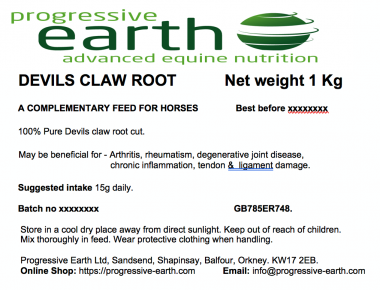 DEVIL’S CLAW ROOT (cut) – Equine pure herb joint stiffness and muscle mobility support. MAGNESIUM OXIDE 90%. Horse calmer, healthy metabolism, hoof health, strong laminae connection.